What is a 3Dx & SDC system? 25 years ago, a brilliant inventor, Harald Feuerherm, invented the PWDS, deformable ring system. Initially, the commercialization of the product was realized in conjunction with Moog GmbH, later, it was commercialized only by Mr. Feuerherm. The PWDS system has demonstrated significant improvements in the wall thickness of blow-molded products. This is obtained by programming hydraulic movements that flex a ring on the die head producing an ovalization of the parison. Our 3DX system uses the same principle of the PWDS, with the benefits of new steel alloys and integrated electronics. Our 3DX system can be supplied with new machines o it can be installed in your existing machine. In this image, you can see a 3DX system installed on each head. This machine is a dual station with 2 cavities 25L container. The mechanized matrix, or core, is one of the techniques that blow-molding fabricators have used for years to improve the distribution of material, but the profile only modifies a part of the longitudinal area of the container. Often, what is needed is a head that changes shape as it extrudes the parison. This is exactly what our 3DX system does. 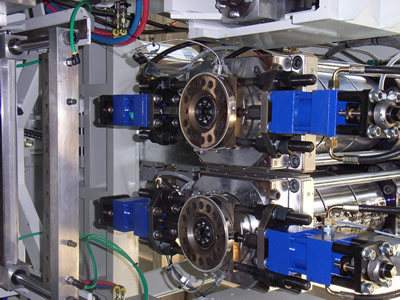 The flexible die, made from a special alloy, is controlled by two hydraulic cylinders. This system allows the removal of the material from areas of the blow-molded part where it is not needed. On some parts, it can represent more than 10% savings on resins. The areas with greater thickness need more time to cool. Eliminating these thicker areas allows for a faster cooling time. Parts with improved mechanical properties. The areas with greater thickness on the blow-molded part are the main causes of failure during impact tests. The areas with greater thickness on the blow-molded part cool slower than the thinner walls, this causes deformations in the blow-molded part. By reducing thickness in the thicker areas, we can lower the product weight and improve the mechanical properties with higher impact resistant and less weight. This allows us to go to the market with a more competitive product.